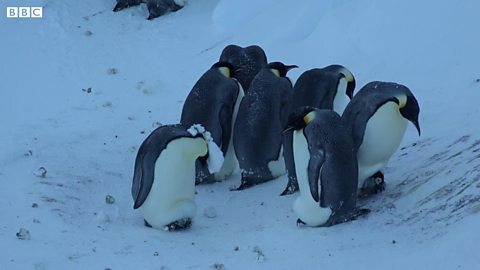 Following a major spring storm – the first to hit the penguins since the chicks had hatched - we headed down to the colony and it was a chaotic sight; there were adults without chicks and chicks on their own wandering around in confusion. We also noticed small mounds of snow; as we got closer my heart sank; each was a chick, which had succumbed to the cold, encased in snow. The more we looked the more bumps we saw. It was a truly sad sight. More dead chicks littered the gully floor, others were trapped alive because their mothers had already made the terrible choice and abandoned them. Following the cacophony of sound we could hear from hundreds of meters away, we made our way to the edge of the ice shelf to look over the colony. Cameraman Lindsay McCrae and camera assistant Stefan Christmann were ahead of me and both let out a cry of dismay as they looked over the edge: below us where the snow had been blown, a large, steep sided gully had formed. In it were around 50 mother penguins, each with a chick on her feet. As we stood there in shock we could see some attempting to escape but without any success. It seemed that the prevailing wind must have blown the colony with their new chicks towards the ice ravine and those closest to the cliff had been pushed in by the weight of the colony behind. More dead chicks littered the gully floor, others were trapped alive because their mothers had already made the terrible choice and abandoned them. It was clear that the only penguins that could climb out were those without chicks on their feet. It was difficult to carry on working in these circumstances but we were there to document events as they happened – whether good or bad for the penguins – so we did. As we filmed the remaining mothers with chicks, it seemed that they had given up all hope and were huddling together to keep warm. Toward the end of the day, we were surprised to see one defiant mother leave the group and using her beak as an ice pick, climb out of the gully with her chick. Surely, I thought, the rest of the females would now follow! But none of them did. Two days later when the weather had improved again, and after more discussion, we finally made it back to the colony. Reaching the gully our hearts sank again; there were fewer adults but more small mounds of snow – the mothers were abandoning their chicks. We knew another storm was fast approaching and that the situation was only going to end one way without our help. We had come to the conclusion that this situation was extremely unusual. We could do something very simple, which would not do any harm and could help some of these birds survive. All we had to do was to spend a few minutes digging some “steps” in the ice to help the mothers climb out with their young. It would then then be up to the birds to find the route and use it. We were unanimous in our decision so we each grabbed a shovel and set to work. Once finished we wished the penguins luck and headed back up to our skidoos to head home. Expecting nothing, we had one last check over the ice shelf edge and to our utter amazement the first mother was already making her way to the ramp! In delight we watched as each and every female slowly, cautiously climb the route we’d dug, out of the gully! The three of us stood there and watched as the line of mothers, with their chicks safely on their feet, made their way straight back to the safety of the colony! There is no doubt in my mind that we made the right decision.